Today, One Earth Future (OEF) and the International Peace Institute are holding Innovation in Partnerships: Making a Business Case for Peace in New York City. Unlike previous public-private partnership endeavors, this workshop series aims not simply to bring about economic growth, but instead focuses on Sustaining Peace as the outcome. As One Earth Future looks to the end of 2018, it has begun to implement a leadership transition that will enable it to continue the growth and progress it has made over the last two years. Larry Sampler, formerly the President of OEF has transitioned to the role of Senior Fellow and Jon Bellish is now Acting Chief Operating Officer. Norfund has, together with Shuraako, a program of One Earth Future, and the Danish development finance institution, IFU, established a USD 10 million fund for supporting small and medium sized companies in Somalia. The Nordic Horn of Africa Opportunities Fund is among the first commercial investment funds for Somalia. Piracy events off the Horn of Africa doubled last year. Incidents in the Latin America and Caribbean region increased by 160%. Piracy continues to pose a threat in the Gulf of Guinea. Kidnap-for-ransom incidents in Asia decreased by 80%. The Swedish International Development Cooperation Agency represented by the Embassy of Sweden, is announcing a comprehensive partnership with major Somali financial institutions to launch a program that will expand the provision of low collateral loans to small and medium size enterprises throughout the Somali region. 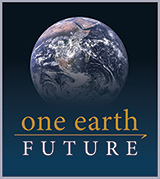 The program will be managed and coordinated by Shuraako, a program of One Earth Future. A new study shows how public-private partnerships can contribute to the data revolution, called for by the UN Secretary-General, to strengthen the 2030 Sustainable Development Goals (SDGs). Jaamacadda City ee Mogadishu iyo Secure Fisheries oo iska kaashanaya sare u qaadida Fahamka Cilimiga ku salaysan ee khayraadka Badaha Soomaalia. Khubarada culuumta badda ee Jaamacadda City iyo Secure Fisheries ayaa isla hawl gelinaya mashruucyo cilmi baaris ah oo lagu sahminayo laguna soo bandhigayo macluumaad cusub oo la xiriira bey’adda badaha Soomaaliya, khayraadka dhex ceegaaga. BROOMFIELD, Colorado and Mogadishu, Somalia - January 29, 2018 - Secure Fisheries, a program of One Earth Future, and City University (CU) in Mogadishu have formed a partnership that will improve Somali fisheries through information sharing, joint research, and education. Will the Next Global War be Over Fish? BROOMFIELD, Colorado - December 19, 2017 - Disputes over fisheries could spark the next war. It is important to better understand the causes and consequences of fisheries conflict - including which ones could ignite armed disputes and which will fizzle out. BROOMFIELD, Colorado - December 15, 2017 - Scholar and peace activist, David Cortright, and his co-authors, Conor Seyle and Kristen Wall, argue that a lack of institutional accountability and a trend toward right wing populism are jeopardizing peace in the United States and other countries in their new book, Governance for Peace: How Inclusive, Participatory and Accountable Institutions Promote Peace and Prosperity.